See our range of fibre optic pigtails in OS1, OM1, OM2 & OM3 below. We hold stock of large quantities of optical fibre pigtails and suggest you use the filtered navigation to the left to find the best fibre pigtails for your application - all manufactured to exacting quality standards. The filters allow you to define your requirements by connector type - from our wide range of connectors including ST, SC, FC and LC or by singlemode, multimode, by length or even by colour. If at any point you need any assistance, please do not hesitate to contact us on 01702 443810. 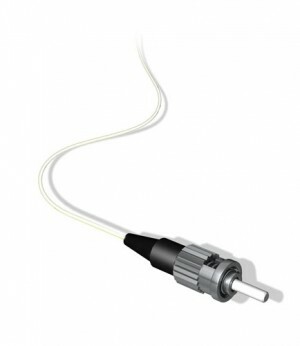 Fibre pigtails are essentially cables that allow light to travel at high speeds with low attenuation and disruption fitted with a connector at one end. Multimode fibre is effectively a light-carrying pipe with a large bore – making it comparatively easy to get light in and out, while singlemode has a small bore but a longer range. The two types are not compatible with each other, and it is imperative that the pigtails in a system are the same mode as the installed cable. 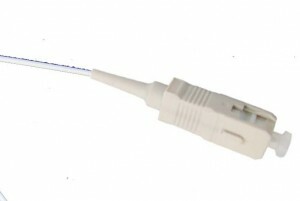 Putting a connector onto the end of a fibre-optic cable (usually called 'terminating') is a delicate and time-consuming task requiring cleanliness and high precision to ensure a high performance result. As such, it is far better suited to a factory rather than field environment where all the variables are far more easily controlled. However, installing a cable is a far easier task if it has no connectors fitted - and such a cable may also be cut to the exact length after installation. The fibre pigtail is the solution to these conflicting requirements - the cable is installed without connectors and is then joined to factory-manufactured pigtails via a relatively speedy, accurate and repeatable process called 'splicing' where the two fibres are fused together and the pigtail connector presented in a rack, cabinet or frame. At MCL Data Solutions we offer both singlemode and multimode fibre optic solutions and if at any point you need any assistance in choosing the best products for your requirements, please do not hesitate to contact our experienced technical staff. At MCL Data Solutions we offer a wide choice of fibre pigtails as well as splice enclosures and panels - from stock, on a made-to-order basis, or to your custom design. Choose from a wide range of different connector configurations and lengths to get the right pigtail at the right price - first time and every time.